Making Kenora HOME Charitable Services Inc., herein referred to as Making Kenora HOME, is a group of individuals representing community members, community agencies, religious organizations and community leaders who meet to identify, discuss and take action on the multilayered issue of homelessness within the City of Kenora. Activating Kenora to address the housing needs of the impoverished requires community engagement, inclusion and commitment. See attached Backgrounder document, Appendix I. 2.0 VISION STATEMENT: Making Kenora Home. See Appendix I. Equality 1. We are all created equal within this world that we share. Inclusion 2. Every person living in Kenora is a part of our community. Sharing 3. As a community we must care for each other. Self-Determination 4. Each person has the right to choose his or her own path providing that path does not hurt another. Empowerment 5. We are accountable for our own actions and need to look inward first before looking outward for change. 4.1 Voting Members must be over the age of 18 years, reside in the Kenora District and support Making Kenora Home’s vision and guiding principles. 4.2 Affiliate members are nonvoting members who support Making Kenora Home’s vision and guiding principles. 4.3.1 The Directors will call a meeting of the membership annually with notification to the membership provided a minimum of 10 days prior to the scheduled meeting. 4.3.2 Quorum for the annual general meeting is twelve members. 4.4 The membership will elect the corporate directors at the annual meeting. The Steering Committee will be known as the HUB and serves as the administrative core of Making Kenora HOME. 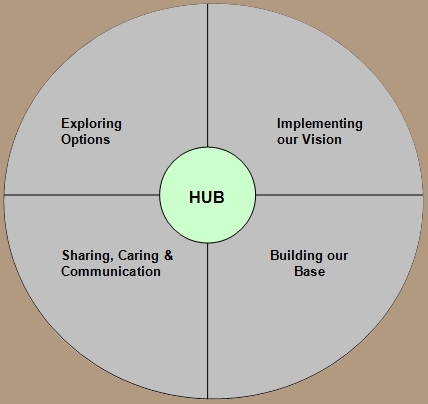 The HUB is responsible for the governance activities of the Making Kenora HOME initiative. The HUB shall consist of a minimum of 10 members. Members will be appointed for a one year term. To ensure the maintenance of continuity and competencies, expiry dates for membership will be staggered. A member may be offered and may accept consecutive terms as approved by the HUB and general membership. As required, the HUB may identify and invite individuals to assist the HUB in a resource capacity. Resource members will not have voting privileges. Members who are absent for three consecutive meetings without notification or reasonable cause may be asked to resign from the HUB. Each member is entitled to one vote. A quorum will consist of half the HUB membership plus one. Votes may be taken over the telephone at the time of the meeting/decision action. A Chair or Co-Chairs (hereinafter referred to as “Chair”) will be chosen by a majority vote of the HUB members. Consecutive terms of office may be approved by the HUB members. In the selection of the Chair, membership will consider members who demonstrate an objective, non-biased perspective. The executive committee shall consist of the Chair, and two chairs of the working groups. A HUB member will be identified at each HUB meeting to be the recorder. Unless the member wishes to remain the recorder for the term, this responsibility will be shared by HUB members. At each meeting the Chair may assign a moderator chosen from the HUB membership to facilitate the meeting process. The HUB shall hold a minimum of six (6) meetings in each calendar year and may meet more frequently at the call of the Chair or, in the absence of the Chair, the Chair’s delegate. The HUB executive, in consultation with HUB members, will schedule meetings of the general membership a minimum of 2 times per year. Members will be given at least one weeks notice and will be notified through the Chairs of the Working Groups and the scheduled dates will be posted on the Making Kenora HOME web site. (i) Meetings will be called at the discretion of the Chair or, in the absence of the Chair, the Chair’s delegate. (ii)	The agendas will be confirmed and amended at the discretion of the individual authorized to conduct the meeting. (iii)	The meeting will be conducted by the Chair. In the absence of the Chair, the person chosen by a majority vote of the members shall conduct the meeting, provided a quorum is present. (iv)	The primary intent of the HUB is to conduct business and to make decisions through consensus. However, motions and membership voting may be necessary for approving minutes and recording agreements on major issues. (v)	Where there is a lack of consensus, the HUB will first seek to clarify all pertinent information, each member being recognized during the discussion process. If consensus is still not possible upon receipt of additional information, the HUB may proceed with a formal vote to finalize a decision. (vi)	At the conclusion of each meeting the Chair, or designate, will set the draft agenda for the next meeting and append it to the minutes. Minutes shall be taken at each meeting and will be distributed to the HUB within 10 working days of the meeting. Distribution may be through electronic mail. A hard-print copy of all meeting minutes will be maintained in a central file, the location of which will be determined by the HUB executive. According to need and by consensus, designated working groups may be declared non-active ( i.e., no active membership or working responsibilities) by the HUB and membership. (i)	Members of the general membership of Making Kenora HOME may self select one or more working groups to serve on. Membership in all working groups, except the HUB, is open and fluid. (ii)	All volunteers for a working group will notify the HUB to include or delete their names on the relevant Working Group membership list. (iii) Only the HUB is subject to size limitations. There are no limitations to the size of a working group. (iv)	A minimum of one member of the HUB will sit on and actively participate as members of each working group. (i)	Each November a Chair or Co-Chairs (hereinafter referred to as “Chair”) for each working group will be chosen by the HUB. (ii)	Consecutive terms of office may be approved by the members. (iii)	The Chair will sit on the HUB as an active member/participant and will report activities of that working group to the HUB. (iv)	In the absence of the Chair, the person chosen by a majority vote of the members shall conduct the meeting and assume the responsibility of reporting to the HUB. In order to report activities to the HUB a minimum of 6 meetings will be conducted by each working group within a calendar year and more frequently as decided by the Chair or the membership of each working group. There is no limit to the number of meetings a working group may decide to schedule. Working group members will be given at least one week’s notice of meeting date(s). When a meeting is scheduled the Chair will notify the HUB for inclusion in an operational calendar. When possible, HUB and working group meetings will be staggered. (i) When a meeting is scheduled, the Chair or a delegated member of the Working Group will notify the HUB for inclusion of the date, time and place in the operational calendar and on the web-site. (ii) If the Chair so chooses, a moderator will be appointed by the working group at each meeting for the purpose of facilitating the meeting. (iii) For the purposes of minute taking, a recorder will be appointed by the working group at each meeting. (v)	The Chair will provide an agenda at the beginning of each meeting, which may be amended with input from the working group. (vi)	All working groups are to be guided by a process of consensual decision-making. (vi)	At the conclusion of each meeting, the Chair and recorder will draft an agenda for the next meeting and append it to the minutes. The recorder will provide the minutes and draft agenda to the HUB for the organizational records within 10 working days. (viii)	Once received by the HUB, copies of each meeting’s minutes will be distributed to working group members within a reasonable time frame. The HUB is responsible for the records of the organization including all operational documents, financial reports and minutes of the HUB/Executive and Working Groups. Any member who has, or is seen to have any interest (whether pecuniary or non-pecuniary) in any item of business before the HUB or specific Working Group(s), must declare a conflict of interest before discussion , decline from participation in the discussion and/or withdraw from the meeting room. Every disclosure of interest shall be recorded in the minutes of the meeting. (i)	Confidential matters will be determined by the HUB. (ii)	HUB members shall respect the confidentiality of matters brought before the membership and shall not divulge information obtained as a result of membership on HUB unless legally required to do so. (iii) Members shall not knowingly take advantage of, or benefit from, information that is obtained in the course of HUB or working group duties and responsibilities which are not generally available to the general public. (iv)	When a member has a concern regarding confidentiality and the sharing of information with a non-HUB or working group member, that member will bring this concern to the Chair of the HUB Executive Committee /Working Group for clarification and further action if required.